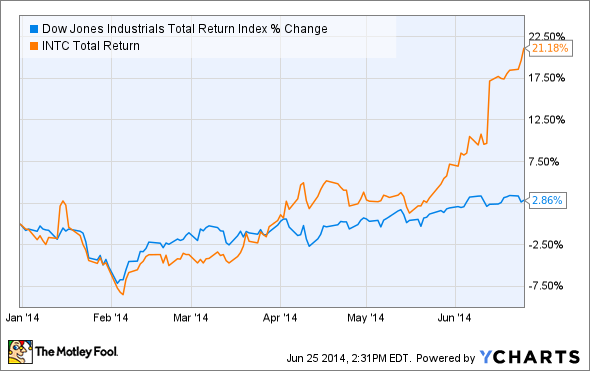 After years of underperformance, Intel is the top stock of the Dow. Our Foolish specialist goes through how that happened and what you should do now. The U.S. economy is already looking well past the reported 2.9% contraction experienced in the first quarter, a figure that was revised up today from a previous 1% estimate from the Department of Commerce. The Dow Jones Industrial Average (DJINDICES:^DJI) showed no ill effects of this uglier GDP number, climbing 0.16% in late trading. Investors are brushing off the first-quarter figure because bad weather was largely blamed for the slowdown and companies that may be affected have already reported earnings. When you include a bullish sentiment from the Federal Reserve, which still thinks the economy will grow 2.1% to 2.3% this year, there's reason to be optimistic about the final three quarters of 2014. One company also brushing off the bad first quarter is Intel (NASDAQ:INTC), which is up 1.5% today and has now returned 21.2% to investors this year, tops of all Dow Jones stocks. Following years of uninspiring returns it looks as if Intel may have gotten some of its mojo back. The run for Intel this year has largely been driven by margin expansion, not earnings growth, but that's in anticipation that the company's investments over the past five years are about to pay off. Intel has invested heavily in improving chip performance and energy usage and will leap past competitors with 14-nanometer chips launched this year. As it brings this new technology to the market, the chip giant will start competing in smartphones and tablets, which it has largely missed out on until now. It also hopes to take a leading position in wearable devices that are hitting the market, as well as connected devices for the Internet of Things. Intel is betting its future on wearable and connected devices. Source: Intel. One example of that was today's announcement that Intel and Ford (NYSE:F) are working together to enhance personalization and mobile technology for vehicles. Their research will bring facial recognition to vehicles, enable entry through mobile apps, and allow consumers to look into their cars remotely using integrated cameras and a smartphone app. As devices become more connected and more mobile, Intel should capture some of the new market with small, efficient systems on a chip, which incorporate connectivity and processing power. While all of these growth markets are great, Intel has also gotten a boost from the slower than expected demise of the personal computer. Higher than anticipated demand for PCs gave Intel confidence enough to boost revenue expectations to $13.7 billion plus or minus $300 million for the current quarter, up from a previous $13 billion midpoint. Given the slowed-down decline of the legacy PC business and the emerging opportunities in mobile, wearables, and the Internet of Things, Intel is in prime position to grow for years to come. This isn't a stock I would bail on because it's having a good year; instead, buckle up and hold on for the ride.